Throughout the existence of railroads, the public has held a fascination with locomotives (especially steam locomotives). Over the years, many gatherings of locomotives, or "rail fairs" have taken place. The railroad exhibition was only a small portion of this huge fair. However, it layed out the ground-work for future railroad fairs. This fair lasted six months. Boston & Providence Daniel Nason number 17 4-4-0. This locomotive is the only suviving example of an inside-connected (cylinders and main rods inside the frame) 4-4-0. Number 17 is now on display at the Museum of Transportation in St. Louis, MO. Standard gauge 0-6-0 named Sampson built in 1838 by Timothy Hackworth, Durham, England. It was brought from England by the General Mining Association, located near Stellarton, to move coal six miles from the mine to the water. The outside of the boiler is lined with wood. It worked for over 40 years hauling coal. After being displayed at the exposition it was moved to the B&O Railroad Museum and displayed until returned to Nova Scotia in 1927. It has been restored at the Nova Scotia Museum of Industry in Stellarton. Standard gauge 0-6-0 named Albion built around 1850 and later rebuilt by Raynes and Burn of Newcastle, England in 1854. It was shipped to General Mining Association to haul coal at Stellarton. It operated for 30 years. After being displayed at the exposition it was moved to the B&O Railroad Museum until its return to Nova Scotia in 1927. Today, it is also located at the Nova Scotia Museum of Industry in Stellarton. This was the first major fair of the 20th century. Starting in May, it ran for seven months. On display were samples of the latest motive power from all of the major locomotive builders. Big Four Locomotive on Turntable. Photo courtesy Mike Truax. This fair lasted for eight months. Transportation was one of the largest and most important attractions of this fair. At the center of the Palace of Transportation was a rotating turntable carrying "a mammoth locomotive weighing over 200,000 pounds." The headlight on this locomotive was illuminated as the locomotive spun around. Also, the body of the locomotive was supported such that the drivers were allowed to continuously rotate. This display was named The Spirit of the Twentieth Century. A 3D (stereo) view of this same display was provided by John Archibald. In another location at this fair, the first locomotive testing facility was designed by the PRR and operated as an exhibit. This unique plant consisted of a test stand that let a locomotive run on rotating drums whose rotation could be regulated through braking to simulate the load of a train under various operating conditions. During the course of the fair, a number of locomotives were "tested" while the public viewed. After the fair was over, the testing facility was dismantled and reassembled at the PRR Altoona Works in 1905. Canadian Pacific class G3D 4-6-2 No. 2333? B&O Class T 4-8-2 5501. See photos. Trevithicks Newcastle Locomotive, built 1805. Philadelphia & Reading RY "Rocket" 1838 (built London). Chicago, Burlington & Quincy class A-2 4-4-0 #35 Photo courtesy Karen Eveson (restored in Denver, 1932) This locomotive is now on display at the Patee House Museum in St. Joseph, MO. Over 30,000 people attended this event. 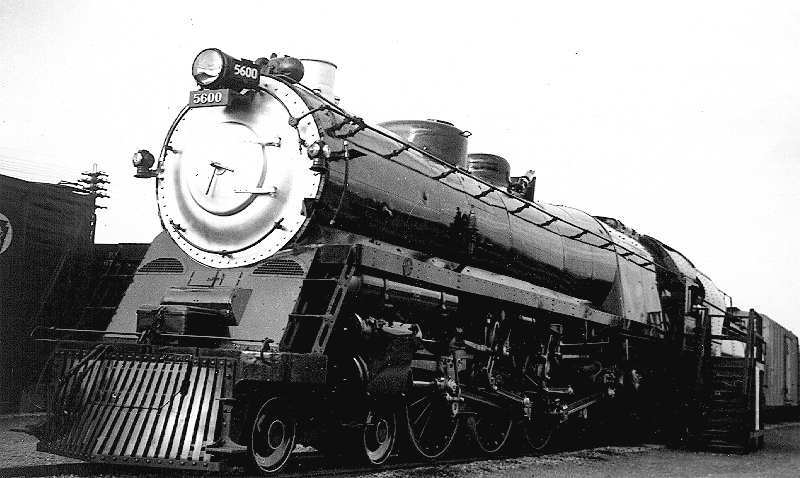 In 1939 the PRR built their first duplex-drive locomotive. The shrouding was designed by Raymond Loewy. During the first two summers of its existence (1939-40), 6100 was displayed under steam at the New York Worlds Fair. Its drivers were supported by rollers which allowed them to turn (under steam) so that the fair goers could watch. During this period, the tender was lettered "AMERICAN RAILROADS". B&O duplex drive 4-4-4-4 #5600 named "George H. Emerson"
Lackawanna Hudson 1151 (ALCO). This locomotive was redesigned with streamlining and renumbered "1939" specifically for this fair. In 1940 it was remodeled again (with feathers painted on the streamlining) and renumbered "1940". London, Midland & Scottish Railway streamlined 4-cylinder 4-6-2 number 6229 "Duchess of Hamilton" disguised as "6220 Coronation", de-streamlined in 1946 (now preserved at the National Railway Museum, York at LMS 6229 "Duchess of Hamilton"). See photo of 6229 and B&O Royal Blue Pacific on the Thomas Viaduct (note the addition of a headlamp and bell). Pennsylvania Railroad H-3 Consolidation 1187 (now on display at the Railroad Museum of Pennsylvania, Strasburg, PA) Note: 1187 was repurchased by PRR from a rock quarry somewhere in Pennsylvania and rebuilt for the fair. After the fair, it went to Northumberland as part of the PRR steam collection. A Seaboard Air Line E-4 diesel renumbered "1939"
The last major display of vintage railroad equipment occurred during this fair. an unspecified PRR "modern steam locomotive"
a 1926 UP 9000 class "Union Pacific"
The Wabash displayed a replica of a Rogers locomotive which was described as the first steam loco to operate in Illinois in 1838. Among the exhibits displayed at this fair were 19 pieces of modern equipment, five pieces of vintage equipment, and an 8-car air-conditioned passenger train. Powerama was not a "railfair". Instead, it was a promotional event organized by General Motors to exhibit their current and future plans including the world's first solar-powered automobile. It was a 15-inch sunmobile built by William G. Cobb of the General Motors Corporation with 12 selenium photoelectric cells. The light was converted into electric current that powered a tiny electric motor with a driveshaft connected to the rear axle by a pulley. In spite of the electric car, Powerama was a diesel engine power show. Its purpose was to show modern power on: oil wells, cotton gins, cranes, trucks, tractors, military equipment, and other machinery where power was used. Powerama visitors also witnessed an E-8 demonstrator unit up off the rails and running. Powerama ran for twenty eight days to show their exhibits to two million five hundred thousand people free of charge. Of course, with a show of this size they had to have a sawmill. Corely Manufacturing Co. of Chattanooga, TN was selected to furnish the sawmill. They were one of the largest manufacturers of sawmills in the business. The Helle brothers of Savanna and Oregon, Illinois were chosen to furnish the logs and their technical ability at sawing the logs. The Oregon crew sawed thirteen hours a day for fourteen days. Then the Savanna crew ran the mill the same comparable time for the same number of days. Canadian National and employees of the Rideau Area take pride in welcoming you to RAILWAY WEEK. Almost everything today is new in railroading. Sleek diesels eat up the miles faster than ever. Research and development keep turning out special kinds of freight. There is also a continuing effort to improve passenger equipment so that train travel is smoother and more comfortable. Canadian National is your Company. See it in action. Talk to the men who manage part of it. From the Railway Week Official Program. 6400, a class U-4-a Northern (currently in Ottawa), was the first of a series of streamlined Northerns built in 1936 for the CNR. In 1939, no. 6400 pulled the Royal Train and was at the New York World's Fair. 6167, a class U-2-e Northern (currently in Guelph), was built in 1940. At the time it was the only operational Northern in Canada. CNR had over 200 dual-purpose locomotives of this design. 5700, a class K-5-a Hudson (currently at the Elgin County Railway Museum (CNR shops), St. Thomas), is one of only five of this type of locomotive. It was built in 1930 for the fast afternoon flyer between Montreal and Toronto. 40, a 4-4-0 (currently in Ottawa), was the only woodburner locomotive in Canada used for exhibition purposes. It was built in 1872 for the GTR and operated for many years in passenger service between Portland, ME and White River Junction, VT.
247, an 0-6-0ST (currently in Ottawa), was built in 1894 for the Grand Trunk Railway. It was used for many years in yard service at Montreal. Note: The 5700 is "really" 5703. After its retirement, it was acquired by the National Museum of Science and Technology in Ottawa. They had some other locomotives which were the first of their series, such as CN 6400 and CP 3100, so 5703 was renumbered 5700 to match the others. 5703/5700 was at the NMST in Ottawa until 1988. Up until August of 1998, 5700 was still the property of Canadian National Railways! The ownership had never been transferred. The Elgin County Railway Museum now owns this locomotive. Photos of The General passing through Carlisle and Miamisburg, OH in the summer of 1963 on its way to the 1964/1965 New York World's Fair. Photos courtesy Chuck Smith. 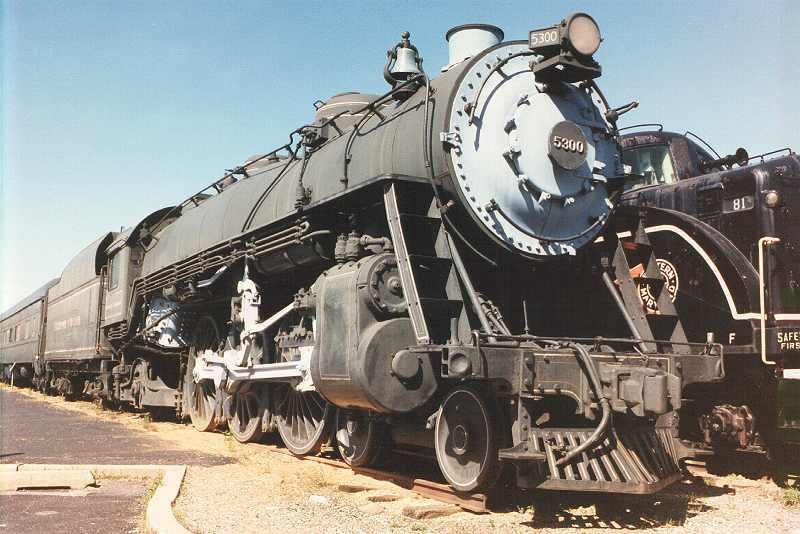 The General is currently an exhibit within the Southern Museum of Civil War and Locomotive History in Kennesaw, GA.
Southern Pacific 0-6-0 #1269 from the Pacific Locomotive Association NOTE: After Railfair '81, 1269 stayed at the CSRM. Ten years later, during Railfair '91, 1269 was displayed with some freight cars south of Miller Park where 4466 ran around her train. Vancouver's SteamExpo was held during May-June of 1986. A total of 21 locomotives (and one crane) were in steam for the event, with 18 of those in service for the entire two-week period. This would make SteamExpo North America's largest gathering of operating steam locomotives since the end of the steam era. All these locomotives, except for 6060, were under steam throughout SteamExpo, moving back and forth through the yard as required. The UP engine even spent an afternoon working the regular CN yard trick, and CN 1392 handled switching duties as the many engines arrived. Delayed by a major rebuild in Jasper, Alberta, 6060 made a spirited run to the coast, and arrived in time to take part in the last few days of the show. Two locomotives, the Quincy Railroad 2-6-2T and a red Pickering Lumber Co. 3-truck Shay were in steam for the first day of the show, but had their fires dropped because of problems with boiler certification. A lack of enthusiasm from BN prevented SP 4449 and UP 844 from attending. Honorable mention can also go to CPR 4-4-0 #374, the first locomotive to pull a train into Vancouver (1886). With low-pressure steam leaking from pops, valves and whistle, the elderly American-type spent the several months of Expo '86 on the turntable of the former CPR Drake St. Roundhouse, right in the middle of the Expo site. Also, former CPR 2-8-0 #3716 was unable to attend because of commitments on the other side of the city; hauling passengers on B.C. Rail's daily 80 mile (on 2.2 per cent grades!) round trip along the Pacific coast to Squamish. Railfair '91 will have something for everyone...Older folks will be fascinated with the nostalgia...and everyone will be intrigued by the sheer size and majesty of a form of transportation many have yet to experience...Children of all ages will marvel at the toy and model trains, and the live steam locomotives...There will be an extensive exhibit of railroad photography and art...and the Railroad Musical Revue will capture the hearts of fair goers as locomotives roll across the stage in a musical salute to railroading... Railfair '91 will commemorate the Museum's 10th anniversary with a grand spectacle emphasizing the history and diversity of the railroad industry. It is destined to be remembered as the great railroad event of the second half of the 20th Century. Ahhh. The sweet smell of coal smoke in the air! Railfair '91 was one of the largest gathering of steam locomotives during the past 10 years. It took place in Sacramento, CA at the California State Railroad Museum. Pictured (left-to-right) Western Pacific F-7A #913, Southern Pacific GS-4 #4449,and General Motors EMD FT #103 (GM's 1st diesel engine, used for demoing diesel power). On Nov. 1-3, 1991, Norfolk Southern, in conjunction with the Tennessee Valley Railroad Museum, hosted a celebration at the Chattanooga Choo Choo, in Chattanooga, TN. The event was highlighted by this triple header excursion with 4501 on the point, followed by 611, and 1218 bringing up the rear. A photo very similar to mine may be seen in the Feb, 1992 issue of TRAINS on page 11. Many more details on this celebration and the envents that led up to it may be seen in the Aug. 1991 issue of TRAINS on pages 30 - 44. Paul R. Tupaczewski has put together information on this event.